Though far from indifferent to any of the fine arts, statuary was his favourite, and he soon became too ardent a lover of antiquity to remain a spectator of its fairest forms without courting the possession. His principal agent at Rome, after he ceased to reside there, was Mr. Jenkins. How he acquired so many specimens of ancient art from the East we have now no means of learning. 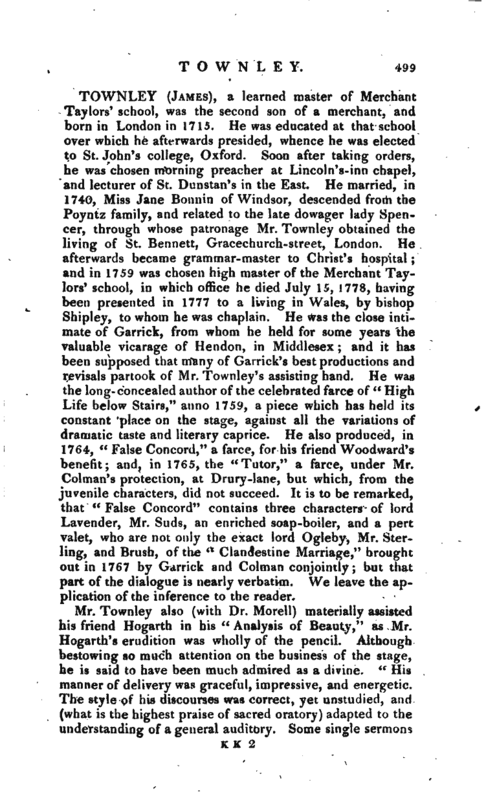 When his “dead family,” as he was wont to call them, grew considerable, he purchased for their reception two successive houses in London; the latter of which (in Park-street, Westminster,) he fitted up with great elegance, and made it his principal residence till his death, which happened, to the unspeakable grief of his friends, January 3, 1805.
thrown on the architectural projections in Basire’s beautiful plate of the cloister court of Whalley was from a correction by Mr. Townley’s hand. At the time of his death a magnificent plate of one apartment in his museum, from a painting by Zuffani, was under the engraver’s hands. It contains a tolerable likeness of himself at fortyfive; and of his friends the hon. Mr. Grevile, Mr. Astle, and Mr. D’Ancarvile. But the misfortune is, that, for the sake of effect, many of the subjects have been transferred from their real situations. The stipulated price of this plate was no less than 1200l. the Isis, the female Bacchus, the ivy-crowned Muse, and the small bronze of Hercules Alastor, found at Biblus in Syria. 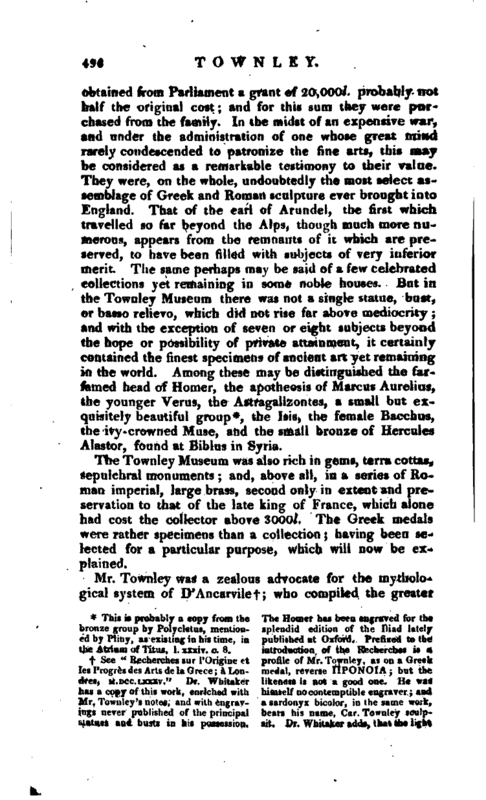 The Townley Museum was also rich in gems, terra cottas, sepulchral monuments; and, above all, in a series of Roman imperial, large brass, second only in extent and preservation to that of the late king of France, which alone had cost the collector above 3000l. The Greek medals were rather specimens than a collection; having been selected for a particular purpose, which will now be explained. 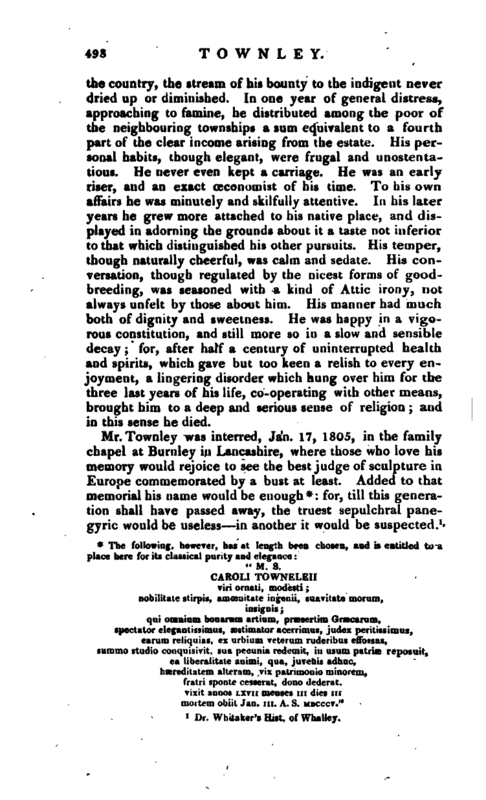 Mr. Townley was a zealous advocate for the mythological system of D’Ancarvilef; who compiled the greater | part of his curious work in Park-street, and derived some of his best illustrations from specimens in that collection. Of this system, which has not been generally received in England, it must be allowed that, amidst the silence of the earlier writers of antiquity, it is powerfully supported by the later Platonists, and the remains of ancient art. The symbols employed by sculptors and engravers to adumbrate the creative, destroying, and restoring powers of the universe, appear to have been connected with the mysteries. By the vulgar they were considered as the attributes of common Polytheism by the initiated they were referred to the Απορητα of their own system. 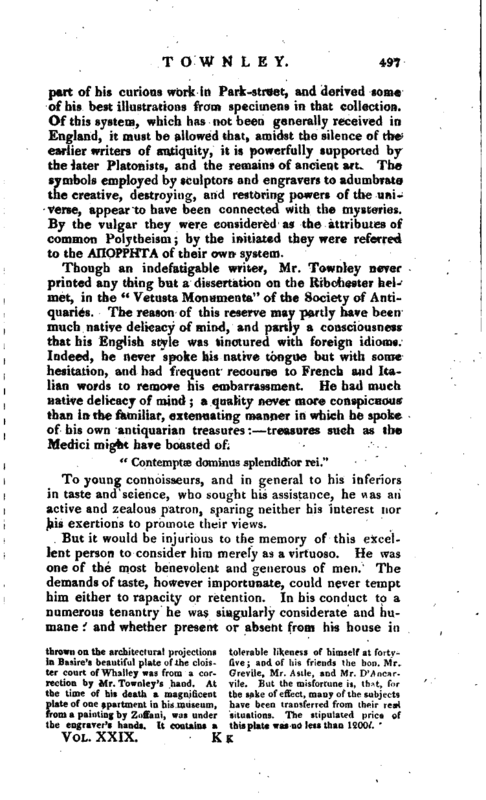 Though an indefatigable writer, Mr. Townley never printed any thing but a dissertation on the Ribchester helmet, in the “Vetusta Monumenta” of the Society of Antiquaries. The reason of this reserve may partly have been much native delicacy of mind, and partly a consciousness that his English style was tinctured witl\ foreign idioms. Indeed, he never spoke his native tongue but with some hesitation, and had frequent recourse to French and Italian words to remove his embarrassment. He had much native delicacy of mind; a quality never more conspicuous than in the familiar, extenuating manner in which he spoke of his own antiquarian treasures: treasures such as the Medici might have boasted of. To young connoisseurs, and in general to his inferiors in taste and science, who sought his assistance, he was an active and zealous patron, sparing neither his interest nor his exertions to promote their views. But it would be injurious to the memory of this excellent person to consider him merely as a virtuoso. He was one of the most benevolent and generous of men. The demands of taste, however importunate, could never tempt him either to rapacity or retention. In his conduct to a numerous tenantry he was singularly considerate and humane: and whether present or absent from his house in | the country, the stream of his bounty to the indigent never dried up or diminished. In one year of general distress, approaching to famine, he distributed among the poor of the neighbouring townships a sum equivalent to a fourth part of the clear income arising from the estate. His personal habits, though elegant, were frugal and unostentatious. He never even kept a carriage. He was an early riser, and an exact ceconomist of his time. To his own affairs he was minutely and skilfully attentive. In his later years he grew more attached to his native place, and displayed in adorning the grounds about it a taste not inferior to that which distinguished his other pursuits. His temper, though naturally cheerful, was calm and sedate. His conversation, though regulated by the nicest forms of goodbreeding, was seasoned with a kind of Attic irony, not always unfelt by those about him. His manner had much both of dignity and sweetness. 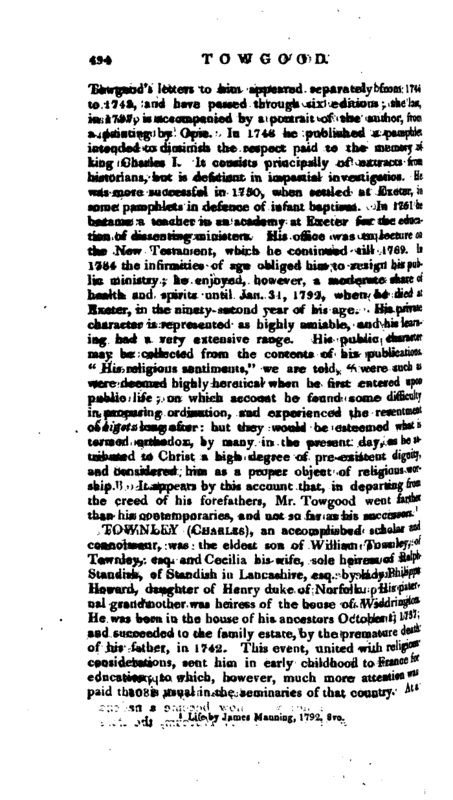 He was happy in a vigorous constitution, and still more so in a slow and sensible decay; for, after half a century of uninterrupted health and spirits, which gave but too keen a relish to every enjoyment, a. lingering disorder which hung over him for the three last years of his life, co-operating with other means, brought him to a deep and serious sense of religion; and in this sense he died. fratri sponte cesserat, dono dederat. mortem obiit Jan. in. A. S. MDCCCV." I>r. 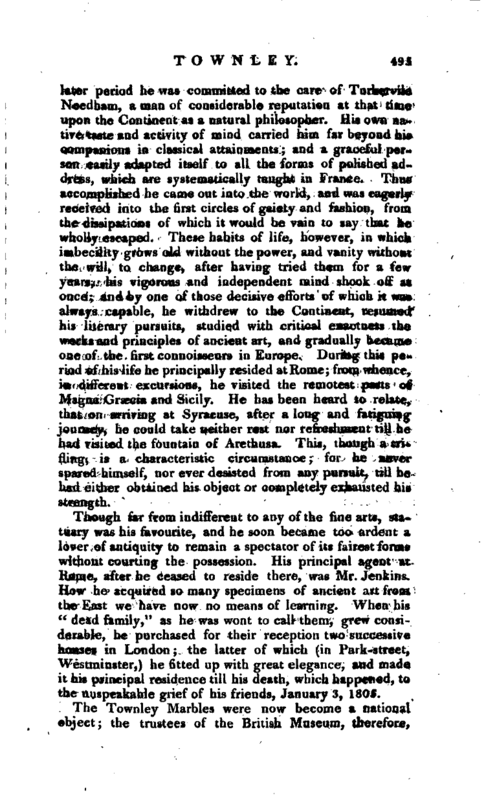 Whitaker’s Hist. of Whalley.